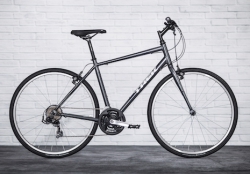 Log miles this month and you'll be entered to win a brand-new Trek FX bicycle from Sunnyside Bicycles. This easy-to-ride bike is great for commuting, distance riding, or just pedaling around the neighborhood with the family. It comes in either standard or step-through frames and will be sized appropriately for the winner. They'll even throw in a light set a helmet, and a flat repair kit. All you have to do is log your miles to win! The random winner will be selected the first week of June. We've also got other prizes from Steven's Bicycles.